How long have you been collecting space? Author Topic: How long have you been collecting space? How long have you collected space? In my case, this month marks my 50th year of collecting space memorabilia. I'll tell you my story, and you should post your own experiences here on collectSPACE. I was 7 years-old when Sputnik was launched by the Russians in 1957. Their unexpected action caused a storm of concern in the West that the Soviet Communists would gain military and scientific superiority. Thus, the "space race" began, with President Eisenhower under intense pressure to do something. 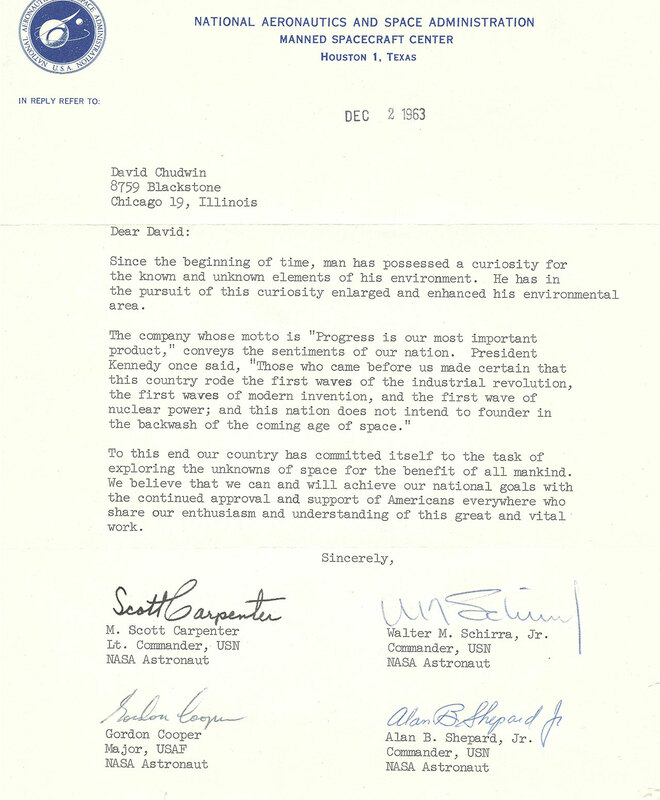 As a result NASA was formed a year later in 1958 and charged with regaining American leadership in space. Engineers at NASA came up with Project Mercury as a way to get Americans into orbit. They chose the Redstone rocket for suborbital flights and the Atlas rocket for orbital missions. They started to design, with major contributions by Max Faget, a capsule to carry men into space. NASA then needed to choose who would be the occupants of these new space machines. An early, and wise, decision was to limit the pool of applicants to test pilots, who by trade were both pilots and engineers used to putting new aircraft through their initial paces. There was intense interest as to the identity of the first space pilots. I clearly remember in 1959 when the "Original 7" Mercury astronauts were introduced with great fanfare. That same year, one of my ninth birthday presents was an illustrated Disney book by Willy Ley called "Space Pilots," my first space book. As the Mercury astronauts trained, the Soviets continued to progress launching larger unmanned satellites and then dogs into orbit. In April, 1961 I remember coming home from school at age 10 and my Dad pointed to the Chicago Daily News which headlined Yuri Gagarin's flight. I remember feeling distinctly disappointed that a Russian was the first man in space and not an American (this was the height of the Cold War). Like other American kids at the time, I exulted in the pioneering U.S. flights by Shepard, Grissom, Glenn, Carpenter, Schirra (a favorite of mine) and Cooper. In the Fall of 1963 I clearly remember reading an article in the Chicago Daily News about a teenage boy who had written all the astronauts at the time (the "Original 7" and the "Next 9"). He had a collection of letters and pictures from them. With my already existing interest in space, I asked myself: why not me? So I hand wrote individual letters to the "Original 7" at the end of October, 1963 describing a 13 year-old's fascination with space exploration and what they had been doing. A few weeks went by and then I received a thin envelope from NASA with a letter dated December 2, 1963 signed by four of the "Original 7" — Alan Shepard, Scott Carpenter, Wally Schirra, and Gordon Cooper. This typed letter sheet (TLS) was the first piece in a space collection that later has encompassed photos, flight plans, books, prints, lithographs, and philatelic items — many of them autographed—over the last half century. Through collecting space, I have had the opportunity to learn about each mission, as well as more about astronomy, engineering, space science and space medicine. I have also had the opportunity meet some of the early space pioneers, including two of the four men who signed my letter (Schirra and Carpenter). Just as important, however, has been the pleasure to meet many other "space nuts," a brilliant (usually) but eccentric (sometimes) group of friends, both online and in person. Since 1999, shortly before discovering collectSPACE. Collecting since 1971, shortly after the Apollo 14 mission. Started watching on TV in 1962 during Friendship 7. Well, my wife says I've been taking up space for 22 years — but while I've always been a science buff and had an intense interest in space travel and science fiction, I've only been collecting space items since July 2012 and had never known about cS or the Astronaut Autograph and Memorabilia show until October 2012. Since then I've really dived into the deep-end of collecting! Although I've been a space fan since the Mercury days, I didn't own anything space-related until 20 or so years ago. On vacation, I picked up some astronaut-signed books, the Shepard autographed photo (framed) with Kennedy and some patches at the KSC gift shop. Since then, the internet has made it possible to obtain many other things. I collect mostly books, but do have a few other items... some art, lithos, etc. If I like it and it is affordable, I go for it! Since 1988, when my first through the mail autographs were the 26R and 29R crews. My first in-person astronaut was Hoot Gibson, who appeared in Cooperstown, NY in 1989, when I attended college nearby. Since Apollo 8 in 1968. I started with the requisite Time, Newsweek and Philadelphia Inquirer/Daily News papers and has gone on from there. I would also write to NASA and get the latest lithos and mission reports - those were the days! Fantastic story and letter David, thanks for sharing. I started writing to NASA shortly after Gemini IV, which really got my interest. Living in Canada I did not expect much but over time, they sent 16mm movies (initially of Ed White's walk), posters and lithos of the astronauts. A series of "red letter" photo prints of various Gemini missions followed. This started a long period of collecting books and videos, but it was only when I found cS that I realized hardware was available too, and that became my specialty. My interest really started with Apollo 8. I was 8-years-old and collected all our neighbours' newspapers to make a scrapbook. And on a family vacation in 1978, I bought my first patches at the Air Force Museum in Ohio. It was an Apollo-Soyuz Program and a Shuttle ALT! I started (unofficially) in 1963 as a 6-year-old, when I cut out a newspaper pic of Gordo Cooper and his family around his capsule right before his flight. Not sure why I found it so neat, but it set off a bomb inside me! Through that summer of 1963, I read every space book that was in the Wichita library! And bought every magazine that had a space article in it (that I could afford on a 25 cents/week allowance...lol). A year or two later I started collecting US stamps. Another year or two passed before I discovered the ultimate crossover...space stamps and covers! So I officially entered space collecting in about 1967. I exhibited space stamps in the Wichita Stamp Show as a junior exhibitor in the early '70's. Then lost track of my space interest while in college in the late '70's. The first items in my space collection were press cuttings of the flights of Yuri Gagarin and Alan Shepard in 1961. My father helped me to cut out the pictures and parts of the stories and paste them into a scrap-book. In 1969 I tidied up the cuttings and transferred them to a new scrap-book, which I still have. In April/May, 1961, I was six. I started my space collecting with STS-2 in November 1981. My dad started collecting roughly around the flight of Gemini-12 in late 1966. He focused mostly on space covers and autographs. He stopped around 1978 and when I showed interest in the space program with the start of the Shuttle program he gave me the thousands of covers in his collection. I have continued collecting space covers and autographs and have branched out slightly to include patches and books in my collection. I quit collecting for about 10 years for the most part in the mid/late-'90's to early '00's because of college, job change (retirement from the USAF and finding a "real" job) and a couple trips overseas that took all my time. But several years ago, my wife told me I needed a hobby after one of my trips. So, I pulled out my collection and have been adding to it ever since. I started collecting space items 46 years ago. I remember staying up to watch the Apollo 11 moon landings. My collection has grown thru the years to include over 2000 space patches (from all countires), a whole wall of space models, many space coins, stamps, first day covers and other space realated items such as the Pepsi and Coke cans replicas flown on the shuttle. My problem now is I have so much stuff, I cannot display most of it. I don't know how long I've been "collecting" space, but for years people have told me I'm unnecessarily occupying it. 1982, the year my (Air Force) family transferred to Edwards AFB...though definitely not continuously since. I was interested in space/aviation prior to that (I remember watching the launch & landing of STS-1 on TV), but it wasn't until we got to Edwards that I recall owning any space "stuff." My mom worked in public affairs, and it was from watching the landing of STS-5 on that I started to accumulate NASA lithos, press kits, etc, and bought my first space patches. I was endlessly fascinated with the history of the high desert, X-planes, etc. and that's when I really caught the bug. Then eventually the "bug" took a long hiatus. We had moved on to our next assignment at RAF Alconbury for just a couple of months when Challenger was lost. By chance, the post-Challenger stand-down coincided with, shall we say, a formative period in my life. I didn't stop following the space program, it just became an ancillary interest. It really wasn't until after I was out of college that I started following the program again in earnest, and only over the last decade or so that I've been actively collecting again, such as interest warrants and means allow. David, like you, I was of a similar age when Sputnik launched into space. For me, it was 1959, I was taken to the local Raytheon plant that would build the Apollo Guidance Computer a few years down the road. My older brother was writing a report on rockets and missiles. While at the company, the manager who guided us through the plant gave each of a small piece of Mylar which was the same as the material used on the Echo satellite. I was hooked from then on and collected newspapers, toys, magazines and NASA related public relations pieces for then on. Yes, college, sports and women took over until about 1995. Then I found out that one could buy flown artifacts at Superior and various dealers. I was off on the collecting binge again. Haven't stopped since. The Chinese have landed on the Moon, Pad 39A has been privatized and I am working in antiquities. David and Larry - same time as you two - 1957, I was seven years old. I started collecting some patches and small items in 1986 at the age of 15. I didn't get my first autograph until 1989 and it was from Norm Thagard. My first space voyagers I met were Bill Shepherd and Vladimir Titov in 1995. Since 1980... so before Soyuz-35 and the first Space Shuttle Columbia missions launches. Collecting materials from NASA about the manned space mission since 1982. I still have my first book 'Joe Allen's Entering Space'. 1984. As I say at the start of every single one of my letters, "From a very young age, I developed a keen interest in space exploration." I have always had a love for space. I don't know how it started, no one in my family follows it, but maybe it has something to do with my parents getting me a plastic model of the Saturn V for one of my early birthdays. I still have it today, only the American flag is scribbled out and coloured in with green, white and amber! I started properly following the space programme during STS-135. I know what you're thinking- what a time to start! When I saw Atlantis calling into port at KSC for the final time, I knew I wanted to be involved in space flight, astronomy, EVERYTHING! I started collecting autographs in January 2012, when I received my first success from Gene Kranz. I don't think I've ever been so excited to go home and check the mail than when I was told on my way home from school that day that there was a letter at home for me from Texas. At the time I only had one request out, so I knew it had to come from the man himself. I think I smiled for the rest of the week! Since then I have gone on to write to a lot of astronauts, cosmonauts, flight directors, pilots and scientists, and let's just say my collection is filling up nicely! I have also made some really great friends during this time, all of whom have helped me out so much already. I know, and I hope they know that I would be nothing without them. At the start I guess I was just a distant admirer and enthusiast of the space programme, and believe me, on the edge of Europe here in Ireland you really do feel distant from time to time! Many of you know that I have been writing my own blog about space exploration, and some of you may not. It's called Irish Space Blog and writing about space and astronomy is something I really enjoy doing. Check it out if you want! Now I get to write about guys flying on the International Space Station, 250 miles above my head. But it's nice to know that I might have one of their autographs, lying 250cm away from my bed! I started to cut out newspaper articles during Apollo 16 (9 years). At the time of (Apollo-Soyuz 1975) the first space models available on the Italian market. But the discovery of a deep love for the Apollo Program took place in the 90's when I realized that the Apollo astronauts were beginning to die... I was afraid of not meet never! Today I smile at the thought, I am a lucky man because I knew them almost all with a lot of them we are excellent friends. When I was very young there were many reports of aliens and UFO's in Roswell and other locations. I remember reading about them in popular magazines. I was always interested in space. How long - about 60 years. I am now 70. My interest in space and space collecting led me to collect space stamps when I was very young. I later became Editor of the IASP's Explorer and the Space Unit's Astrophile. My collection is gone now but I still buy a few space covers and re-sell them online on Listia and eBay. It is still my hobby of choice. I got hooked in 1989 when I designed the exhibits for the U.S. Astronaut Hall of Fame in Titusville. The project was sponsored by the U.S. Space and Rocket Center and the Mercury Seven Foundation. I got to "work" with the 6 surviving Mercury astronauts, it was, and still is, a thrill.